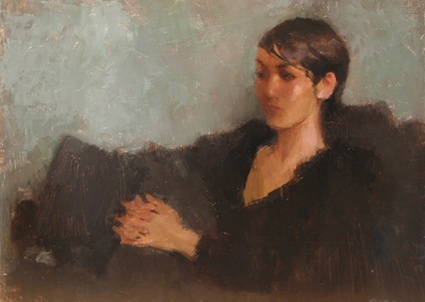 Scott Greene began his art education at the California College of Arts and Crafts in Oakland, eventually receiving his BFA from the San Francisco Art Institute and his MFA from the University of New Mexico in Albuquerque. Adopting the language and finish of classical painting, Greene draws inspiration from both art history and the contemporary social environment, to humorously examine the relationship between politics, nature and culture. Greene’s work has been included in exhibitions across the US and internationally, including: non-profit and museum shows at Schneider Art Museum, Southern Oregon State University in Ashland, Oregon; Kohlar Art Center, Palo Alto Art Center in Palo Alto, California; Arnot Museum of Art in Elmira, New York; University of Virginia Art Museum, Virginia; The Albuquerque Museum in New Mexico; Austin Museum of Art in Texas; Carlsbad Museum & Art Center in New Mexico; and Triton Museum in Santa Clara, California. His work is represented in the public collections of the Anderson Museum of Contemporary Art in Roswell in New Mexico and the McKesson Corporation in San Francisco. His paintings have been featured four times for New American Paintings and awarded among others the Juror Selection Award from Lubbock Fine Arts Center, an the Roswell Artist-in-Residency Fellowship. I love your work .Have ben following for such a long time . You are such s great artist. Love to you all. I'm just going to comment about the meaning I see. 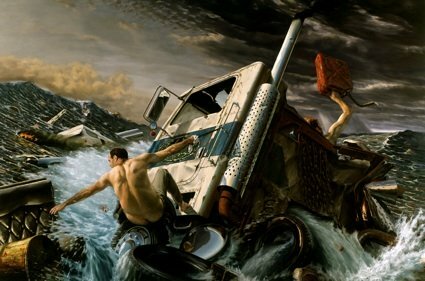 The semi-truck sinking-to me repsresents the demise of the trucking industry because of the high price of gas. The beginning of the collaspe of our infra structure which is based on trucking. 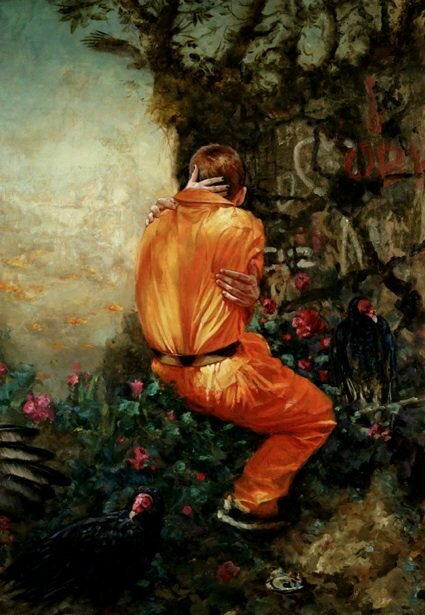 The young man in Orange jump suit- He's a convict in love with himself and his acts, seemily unaware that society does not approve. The temptress of death is embracing him with her black finger nails and the voltures are waiting. He may have thought it was cool to be crimminal and is about to pay the price unknowingly. pic a;inefficiency of equity at the face of a catastrophe. Nice work! Very detailed and interesting. You have a very unique way of seeing things & an imaginative mind! Keep up the good work. This is beautiful. A skilled artist.